What colours would they be? How do you know this? Who in your community is referred to as ‘Mrs’? What does this person look like? What job might they do? What other titles are used in the community? Example: Elder, Aunt, Nonna, etc. What is in a desert that would be red? 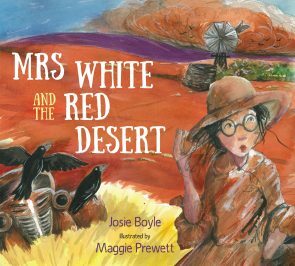 Elicit student’s prior knowledge by encouraging them to illustrate Mrs White and a red desert as two separate illustrations. Discuss what might happen if these two things met. Ask, ‘What would happen if something red was to mix with something white?’ Illustrate this by mixing white and red paint. Record what happens and ask students to describe the change in the white paint. Present students with the front cover of the book. Allow them to use their experiences from the previous activities to predict what might happen in the story. As a class, invite students to create a story map that predicts the sequence of events. Read the text to students. Begin a discussion around the idea of Country, linking in with the title of the book. It is important for children to have an understanding of Country and the Indigenous history of the land on which they go to school. Explain that this book is set in the ‘Red Desert’ and that this is another part of Australia. Discuss the Country in which your school is set. Link the students’ schema of Indigenous Country with the knowledge presented in this story. Compare and contrast the setting of the Australian outback, specifically the author’s home Country around Kalgoorlie in Western Australia with the home land of the students in the class. Using Google Maps view Laverton and the environment around your school. Compare and contrast the settings of the two Countries using a venn diagram. This can be completed digitally through Creately. Do you know the language group of this area? Do you know the boundaries of this Country or how big it is? Do you know if there are in special Indigenous places on this Country? As a class work together to devise an Acknowledgement of Country. It should include; reference to the Traditional Owners/Custodians of the area and a statement of respect for Elders past and present. If students are unaware of the Country on which the school is located you can locate it on this map. After reading through the story a second time with your students compare the events that happened in the story to your students’ lives. This type of connection will develop a frame of reference allowing students to infer and understand the text in greater detail. Students compare their knowledge and experiences to those presented in the text through a patterned writing experience. Present students with the text from the book, Sand and spinifex whipped our legs and flew at our heads. Explain that students will be replacing some of the words with those that describe their experience of a different weather phenomenon. For example, wind and hail whipped our legs and flew at our heads. Encourage students to write their own descriptive sentence using the vocabulary collected during the shared reading experience. They could then illustrate this in a series of before, during and after images. Read the book again, this time asking students to focus on the character of Mrs White. After reading, examine the illustrations and text that mentions Mrs White. Explain that the book does not describe her in detail, so it is our job as readers to infer more about her character. She is their teacher. Who else she teaches. Explain to the students that they are to imagine that Mrs White will be visiting the class and that the students will be interviewing her. Firstly, discuss what you might need to do to get the classroom ready for her visit. Make a list based on images in the book on pages 8 and 9. Next, guide students through the process of creating questions to ask Mrs White during her visit. Revise the list of known and unknown information about Mrs White, using the unknown information as prompts for questions. Prepare the class for the role play drama that is to follow. Tell them you are stepping out of the class for a moment, and a visitor from the story will arrive. Tell the students that they are to welcome the visitor and are allowed to ask questions of the visitor. Dress up as Mrs White and ‘visit’ the class. Allow students time to ask their questions and answer them, referring to the story wherever possible. In order to develop students connections with the text and their knowledge about teachers, compare and contrast the different portrayals of teachers. Read chapter 7 titled ‘Miss Honey’ from the book Matilda by Roald Dahl. For more information about Miss Honey refer to this fact sheet about her. Next, read this nonfiction text on a teacher in America to the students (this text is also able to leveled to make it more readable for Year 2). Finally, in small groups ask students to brainstorm some of the qualities of one of their teachers. Using the information gained from these two texts and students’ prior knowledge complete this two-way table. Conclude this activity with a discussion on the role of the children in the book who act as teachers to each other by telling each other stories in the sand. Ask your students how these children also act as teachers. Encourage your students to see the connection that teachers come in various forms and that diversity is not deficit. For the next learning task focus on building vocabulary knowledge about the setting. To introduce this lesson explain that the narrator of this story uses the first seven pages of the book to describe their home and how special it is. Place students into seven groups, giving each group one of the seven pages to focus on. Explain that you would like each group to notice the descriptive language used and what that vocabulary means. If students have difficulty understanding some of the vocabulary prompt them to look at the images for clues or to research words using the children’s online dictionary. Make a class list of the descriptive language found on each of the pages. Explain that the students will be designing and recreating the setting found on their page in a diorama form. Many of these may be similar but with a different focus. For example one group will focus on illustrating the hot desert winds blowing through rusty nail holes, while another will focus on recreating the corrugated iron that is wavy, buckled and bent. In small groups allow students time to design and build their settings. For this activity students could use recycled materials such as boxes, cardboard, packing materials, aluminium foil and masking tape. Using their newly created settings work as a whole class to complete an oral retelling of the story. Firstly, ask students to create a story map of the book as this will assist their retell. For more information and templates refer to this site. After the students have created a story map demonstrate a successful oral retell, using one of the settings and cut-outs of the characters. Allow the students time to create paper cut-out characters on paddle-pop sticks and practise retelling with their props. Once students are happy with their rehearsed retell they can record their retelling puppet shows using WeVideo. Discuss what students already know about the structure of a narrative. After students share, explain that the structure and length of an orientation, complication and resolution is different in each narrative depending on the author’s purpose. Why did you choose that card? What makes this part of the orientation/complication/resolution? What features are you noticing that helps you make your decision? Discuss the length of the orientation in this story with the class. Ask them why they think the author spent so much of the narrative explaining the setting. Discuss what effect the long and descriptive orientation had on you and the class as readers of this narrative. Finish this task by asking the students to write a summary of each part of the text on the back of their corresponding piece of paper. Take time to examine the images on the endpapers (the page before the title page and after the story concludes). Explain that these are like the stage curtains for a play. They are the first thing we see and the final thing after the story finishes. So these pages set the scene. After sharing this with the students examine the endpapers all together. the lines that have been used to draw the leaves suggest movement. colours and variety of shapes in the watercolours. Refer to the first page of the story that mentions drawing stories in the sand. Relate this to the endpapers as a story in a picture. The endpapers show the setting and they have splashes of white that might suggest Mrs White as a character. Allow students to share their ideas on the story portrait in the endpapers. Discuss how a picture in the sand can tell a story with images as do the endpapers. Reading through the text again explain to students that as you read you will be recording nouns on a sheet of paper. Next, explain to students that you would like them to categorise these nouns. Discuss and list some different categories that students can identify. For example people, places, things. Once you have decided on your categories ask students to place each of the listed words into a category on the recording sheet. Explain that these are all noun groups. Each group is describing a ‘thing’ (wind, holes and shutters). But rather than just saying the ‘thing’ on its own, the author adds several words. Next ask the students what the job is of the words listed before each ‘thing’. Explain that these words describe or classify each thing. In this sentence the descriptive words (adjectives) are hot, rusty, old. Explain that there are also words that classify some of the nouns such as: desert, nail and wooden. Discuss the order of the classifiers and describers with students. Ask them if they see a pattern in each noun group. Assist students to conclude that the describers always come before the classifiers in a noun group. Remove the describers and classifiers by crossing them out or rewrite the sentence so that it now reads; ‘Winds blew through holes and shutters.’ Discuss how the text has changed and how the image of what you are imagining as you read might have changed. Ask students to explain the function of the removed words. As a class complete patterned writing with this sentence using different describers and classifiers to replace the current ones. An example of a piece of patterned writing on this text is, ‘Cold winter winds blew through new bullet holes and frozen shutters’. Using the information gained in the above lessons ask students to create their own piece of patterned writing based on the sentence that you analysed. Once students have created their sentence, using noun groups, ask them to illustrate it in one picture using a similar technique as in the endpapers of this book. They could complete this in a watercolour style similar to the book if this is appropriate. Finally, ask students to identify from where in the narrative their sentence might belong. Would it be in the orientation (something to set the scene)? The complication (a problem that arises)? Or resolution (something that concludes the problem)? Ask students to label the part of the narrative where their sentence and image might belong. On the first page it is mentioned that the children ‘…drew in the sand to tell our stories’. Reflect on the endpapers activity in the previous section and how an image can create a story. Ask the students to talk about what they know about the important role of oral language and sand storytelling? You can find more information on oral communication here. Guide students to think about the way that oral storytelling is changing with technology. Explain that new media is encouraging us to share more stories orally using images to illustrate the oral retelling. Watch this clip on digital sand storytelling. Brainstorm other ways that we can use technology to tell stories. During this brainstorm note students’ understanding that drawing online is one method to illustrate an oral story. Explain that this story is from the perspective of one of the children. Discuss how the story might change if it was from Mrs White’s perspective. Using the online drawing tool AutoDraw ask students to complete an oral retelling of the story from Mrs White’s perspective. Invite students to present these oral stories to the class. During this unit of work students have had the opportunity to innovate on the setting, characters and language in this book. As a final task invite students to combine their innovations to design a new narrative in which Mrs White will visit somewhere special to each student. Brainstorm as a class some special places where Mrs White might visit. Discuss what could be a feature of each place that Mrs White might not understand, just as she didn’t understand how red dust makes everything dirty. See the table below for some example settings and problems. Students plan their story and illustrations using a storyboard method. Explain that after the students design their story they will complete an oral retelling using AutoDraw to illustrate as they present their story. These oral presentations could occur in small groups using tablets to draw the stories or in front of the whole class presenting the images on an interactive whiteboard.